Ages ago. I listened to this ages ago. And it's taken me so long to put a post together that I felt good about because I so want to accurately convey my love of this story without giving one iota of the subtle plot away. I decided to download and experience this in an audiobook format. (Lately, I've found that my previous perception of audiobooks was either wrong, or maybe I just needed to get used to "reading" this way. I'm still not sure what made me fall in love with audio, but now I can never be in a car without one ready to go). Never Let Me Go has been such a popular book and a movie with Carey Mulligan and Keira Knightley was recently released which I've heard great things about, so looks like I'm going to have to Netflix that one soon. Kathy H., our main character and narrator of the story, is a carer (or caregiver) by occupation. Now in her early thirties, Kathy's path has crossed once again with two former classmates, Tommy and Ruth. Once best friends at Hailsham, a beautiful private school separated from society with its own secrets, Kathy begins to share the story of their lives as children, which ultimately affects them today. And it's not a story with adventurous boarding school events - rather it's a quiet study of human behavior, an uncomfortable understanding of what is valuable and true in all of our lives. To give any more of the story away would mean I'd have to do a spoiler warning and I just can't do that. I want you to experience this story completely and go into it without knowing anything other than what I've just given you. Suffice it to say that the story is melodious, haunting, compelling, and somewhat frightening. Certain moments and realizations surprised me so much that I was stunned by the characters' acceptance of their lives and each situation. I was speechless and with rapt attention I was captivated through each memory Kathy shared. I felt a connection with each character and each emotion - it grounded me to a halt and sometimes I would shut off the audio and think about what had just happened, marveling at Kazuo Ishiguro's ability to brutally mesmerize me. The magic is in the story's reveal - while it is not shared to the reader in one flashing and climactic moment, instead it is pieced together, pocketed into Kathy's honest and simple telling, slowly tugging at you to reconsider what really should be acceptable. If you enjoy a story that questions society in a quiet and indirect manner, then you will love this story. As I did. Emilia Fox was the narrator for this production and she was phenomenal - I can't imagine anyone else capturing the haunting story so effectively. I'll be eagerly looking for more from her. I have heard some great things about this authors writing. This particular book has been on my TBR list for some time now...may just have to move it up. This was such a powerful book for me. I absolutely loved it. Ishiguro is the consummate stylist, in that his style is almost invisible. Such a great story. I read it a month or so ago and it's still with me and revealing itself in new ways. I just watched the movie last night and it actually added to the story for me, which is unusual and wonderful. Definitely watch it (it's not available instantly yet but is worth waiting for in the mail). My audiobook TBR list is now on the rise! I've had this book on my wish list for a while. It sounds outstanding. I listened to this, too, and thought the reader added so much to the overall experience - such a perfect, haunting delivery! A friend of mine recommended this book to me recently. I'm going to look this book up soon. I loved this book, and it's one of the first books that my husband and I read together. We had such interesting conversations with each other when we finished, and also went out and saw the movie. I would say that the movie was really well done, but it doesn't hold a candle to the gentle sadness of the book. This was a great review, and I am glad that you liked it so much! I really can't believe I haven't read this book already. It's been on my stacks for YEARS. I've vowed to read it this year, so we'll see if I make it! I could have written the first paragraph of this post! I feel exactly the same way. I LOVED this book, which I also listened to on audio, though with a different narrator. I LOVED my narrator, Rosalynn Landor, too! Too weird. You've done a good job reviewing the book and I think it is important that readers experience the slow unfolding of the story as Ishiguro presents it. Good for you for not ruining it. I also loved the movie and felt that it added a whole other layer of understanding to the characters psyches. As a side note, I local library was hosting a discussion of this book soon after I read it and I was so excited to attend. I was sorely disappointed, however, because I was the only person who liked the book. It seems that all the other readers got caught up in the surface layer of the story and no one seemed to grasp the deeper meaning. So disappointing! I'm looking forward to reading this! We too always have an audio book in the car - they just are geared toward 12 and under. : ) Currently, we are all obsessed with the Peter and the Starcatchers series -- it has been great. (And Jim Dale, who also narrates Harry Potter, is amazing.) Hearing a book, as opposed to reading it, adds a whole different layer. I have issues with audiobooks (I've only gotten through The Mortal Instruments series on audio, after I read them), but I think I'd be willing and probably eager to listen to this one. I read this last year (maybe earlier this year?) and was, like you, completely absorbed, captivated, and astounded by Ishiguro's superb storytelling. This instantly became one of my all-time favorite books. Ever. I agree with you not giving anything away in your review too. To say anything more, would make the story less affecting. When I read it, I went in blind, with no clue what it was about. It was INCREDIBLE. I remember loving this book, and being completely floored. 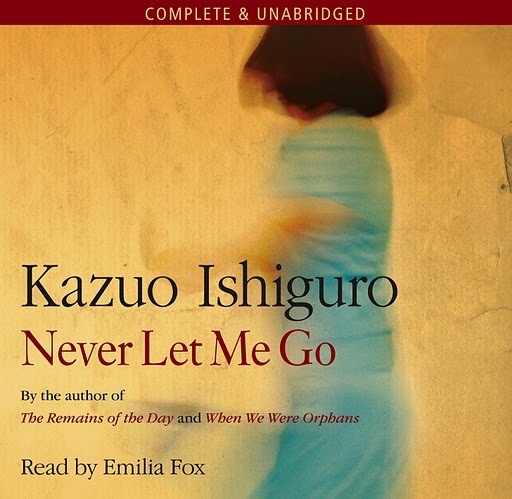 Enjoyed it much more than Ishiguro's When We Were Orphans, and then I recommended it to my mum, and she hated it so much that she said it's the last time she's reading a book recommended by me. Glad you enjoyed the story though... I'm still not sure about audio books, but I did enjoy the only one I've "read". I've never been a fan of audiobooks. I guess I'm just not a very good auditory learner because I need to see the words to find the meaning in the story. However your review of this one has made me wonder if I shouldn't give the whole audio thing another try. I didn't love that book that much at first, but the more I thought about it, the more I loved it, and it ended up on my list of favorites. I'm not a fan of audio, but I might actually give it a try since I know how much I enjoyed the book! Thanks for the recommendation! I'm actually looking for a new audio because the one I have in the car isn't holding my attention. I have this one, I'll have to pick it up sometime soon. I struggle with audiobooks, I tend to stop paying attention and then feel lost. Great review! I've yet to read this one, but I thoroughly enjoyed Nocturne & have The remains of the Day + When we were orphans, sat on my shelf waiting my attention, so thanks for your post & another addition to the pile. I think that is what stunned me the most too, how the characters accepted their fates. Yes, it is certainly a very haunting story. Great review. I'd love to hear this book on audio. I read this a few years ago, and it is a challenge to talk about it because it's such a great book to go into with a clean slate. I should try a reread on audio. It sounds like it was great.